The door between Myanmar and the rest of the world is opening after a half century of restricted global engagement. That’s good news to residents of Congheng Zamual. Although their rural village is remote, it is near a main road that winds through the mountains of Chin state along Myanmar’s eastern border with India. But they are also learning that the door swings both ways. In one direction, it provides access to markets, education and medical care for these near-subsistence farmers. In the other, it drains the village of residents, who leave to look for a brighter economic future abroad. Catholic Relief Services and our Church partner Karuna Mission for Social Solidarity are working to increase economic opportunities in Congheng Zamual so the villagers can stay and work toward a better future for their homeland. Increasing opportunity at home will provide families with more choices for their future. With resources from the Livelihoods and Food Security Trust Fund supported by the U.S. Agency for International Development and DFID, CRS and the mission’s PACE project, or Productive Agriculture Through Community Engagement, are addressing two major problems: poor nutrition and low agricultural production. We’re showing farmers how to sustainably coax more from their land and, through nutrition and cooking classes, helping them add more variety to their staple diet of corn. That’s why Biak Ne Sung joined the project. Her husband migrated to India to work in logging, but sustained a serious back injury. Forced to return home, he has been working sporadically in carpentry. She feels the strain of trying to feed their four young children while the family tries to rebuild after their home collapsed in a storm in 2015. They currently live in a makeshift kitchen shed where each morning Biak struggles to stretch their meals. When she was a child, she remembers, people had more variety in their diets—not just corn or rice, but other food they grew. 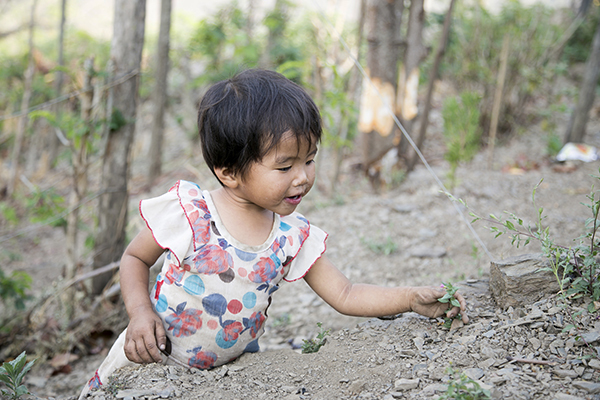 In addition to better ways of preparing meals for her children, Biak will learn techniques to grow more food on the rocky hillside she inherited from her father. More crops, and knowledge about a diverse nutrient- and vitamin-rich diet, will improve the children’s health. “This project is about nutrition and agriculture, but it’s about so much more. It’s about helping families have more options in rural places where choices have been limited by remoteness, scarce resources—and now, changing weather patterns,” says Scott Braunschweig, CRS country manager for Myanmar. By increasing options, women like Biak can choose new ways to feed their families. And families who were thinking about abandoning their land can choose to stay, as new methods make the difficult soil productive. CRS is committed to bringing these techniques to more farmers desperate for opportunity in far-flung mountain villages tucked into mountainsides along Myanmar’s rutted roads and winding footpaths. The PACE project is opening doors of opportunity so that migration isn’t the only path to a good future. 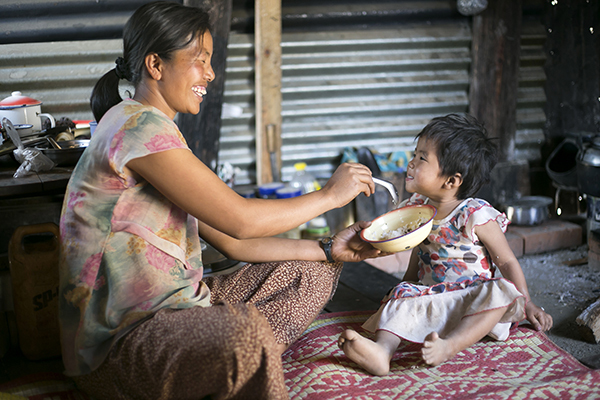 Through better nutrition and harvests, families have the option of staying together in Myanmar.